Living organisms require a daily intake of nutrients taken out of the body, ingested and assimilated into the tissues, promotes growth, preserve good health, provide energy and replace losses. Some substances are needed in large quantities, are the four macronutritivi: proteins, fats, carbohydrates and water. Other substances, micronutrients are needed in small quantities: this is of some minerals and vitamins, fats and essential amino acids (the elements that make up proteins). These are called essential because the body does not produce them, although it produces more acids and amino acids. The human body contains tens of thousands of different proteins that serve different purposes. Proteins are long chains of amino acid residues: there are more than twenty different amino acids; the nature of the individual proteins is determined by the sequence of these amino acids in the chain. Amino acids are molecules rather small, consisting of a number between ten and twenty-six atoms of hydrogen, carbon, oxygen and sulfur; at least one of the atoms is nitrogen. The hair and nails consist of fibers of a protein called keratin; muscles are composed of fibers of myosin and actin. Another fibrous protein, collagen, strengthens the skin, blood vessels, bones, teeth and intercellular substance that binds cells and tissues in various organs. The globular proteins in solution in the fluids of the body, serve as enzymes to accelerate the chemical reactions essential to life. The hemoglobin, for example, the protein red, which is found in red blood cells, leads the oxygen from the lungs to other parts of the body, where it is used to burn the molecules of the food in order to provide energy. The amount of protein required to balance the amino acid in an adult is proportional to body weight and is about 1 g. of protein per kilogram of body weight. The majority of adult individuals ingests the amount of protein recommended in measuring two or three times greater. The excess, not necessary for the production of new molecules of protein, is burned for energy purposes, together with fats and carbohydrates, and probably, in reasonably good health of persons not result in any damage by this excessive ingestion. A considerable amount of protein means that a large amount of nitrogen in the form of urea must be expelled through the urine. The expulsion of urea committed the kidneys; greater intake of protein increases so the work of these bodies. Individuals with poor kidney function, such as those who have only one kidney, or suffered nefritici can prevent further limiting the ingestion of proteins. Fats are an important component of the diet as a source of metabolic energy. They also serve to help the passage of the fat-soluble vitamins (soluble in fats) in the bloodstream through the intestinal walls. It is said that the fat is saturated (saturated fats) by hydrogen (H) because the hydrogen atoms occupy the four bonds of each carbon atom (C) that are not linked to other carbon atoms or oxygen. Unsaturated fats have fewer hydrogen atoms. The saturation is expressed in a higher density: the saturated acids are generally solids, while unsaturated fats are liquid. It follows that the saturated acids have a greater tendency to settle along the blood vessels, forming atheromatous plaques, with the risk of coronary problems. The unsaturated fatty prevail in plants and fish, and are divided in turn into monounsaturated (only one double bond, olive oil) and polyunsaturated (two or more, sunflower oil). The recommended amount of fat in the diet is 25-30% of total calories consumed daily. Monounsaturated and polyunsaturated fats should be consumed in similar quantities, while saturated fats should be limited to a maximum of 10%: in other words, assuming a fat intake to 30% of total calories, you can start the intake of saturated fat , monounsaturated and polyunsaturated fats in equal parts. Essential fatty acids (EFA, essential fatty acids) are those fatty acids that man must be introduced through the diet to keep the body in good health. Some of these fatty acids required by the body can not be synthesized. I'm basically only two essential fatty acids that the body can not synthesize and therefore require additional supplementation (integration): alpha-linolenic acid, an omega-3 and linoleic acid belongs to the group Omega 6. Carbohydrates were called thus because chemists noted that these substances (various sugars, starch, glycogen and cellulose) have the formula C + H2O, which contain carbon + water in proportion. Simple carbohydrates are also distinguished into monosaccharides (glucose, fructose) and disaccharides (sugar, lactose). Simple carbohydrates are made up of molecules of sugars, and their intake occurs through the fruit, some types of vegetables, milk, sucrose and sugar. Sugar is also added as an ingredient in ice cream, cookies, cakes, chocolate and many soft drinks. Simple carbohydrates fail to provide energy ready to be used, because the body is able to divide them with immediate ease. This is the reason why after having consumed immediately feel more energici.Tali foods are classified as hyperglycemic. Complex carbohydrates are composed of starch and dietary fiber, have a chemical structure more complex and it is for this reason that the body uses more energy and a higher amount of time to digest and break them down. After having consumed it do not feel an immediate increase in energy level. The energy is released by a process more complex and slower. 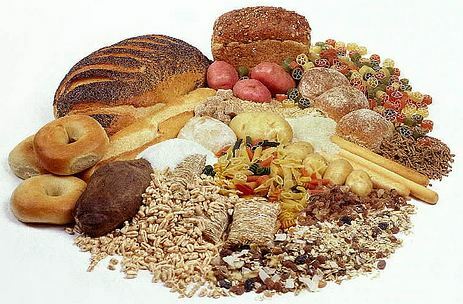 • Carbohydrates light: whole wheat bread, brown rice, vegetables, legumes and grains. The heavy carbohydrates have a high glycemic value that causes the body to produce high levels of insulin and they are difficult to digest, they slow down the digestive process. Even the dietary fiber carbohydrates are considered: are the structural part of plants and are virtually indigestible. For this reason, facilitate the transit of digested food through the small intestine, large intestine, helping prevent constipation states. In a balanced diet of an adult, carbohydrates should provide 55-65% of total daily calories. The amount of carbohydrates ingested should be maintained in the amount that allows the ingested fat to be burned instead of being deposited in the body. Water is the fourth main food. To live is required to the extent of about 1 l. per day, in part to produce urine, which expels the harmful substances which are selected from the blood during the filtration process that occurs through 2 million filtering units (nephrons) existing in the kidneys. Greater ingestion of water, preferably 3 l. per day is necessary for good health, a good habit is to drink a glass of water every hour. One of the reasons why it is good to ingest water in large quantities is that it leads to produce large amounts of urine. This is especially important for people from poor kidney function. Another reason that suggests high ingestions of water is that in this way decreases the possibility that by body fluids to originate crystals of various kinds. Gout is caused by the formation of sodium urate crystals in the joints and tendons and pseudogout a similar crystallization of calcium pyrophosphate dihydrate. Kidney stones consist of the formation of masses of crystals held in a protein matrix. The various classes of foods (meat, fish, fruit and vegetables, cereals, dairy products ...) are all valid in providing protein, fat, carbohydrates, minerals, vitamins and other micronutrients valid. The amounts of these important constituents differ from food to food and it would be wise to eat a varied diet and whether we want to add the key vitamins and minerals, so as to swallow the optimal extent. Obesity and atherosclerosis, the two most common afflictions caused by poor eating habits towards macronutritivi, are the consequence of the violation of these simple rules.